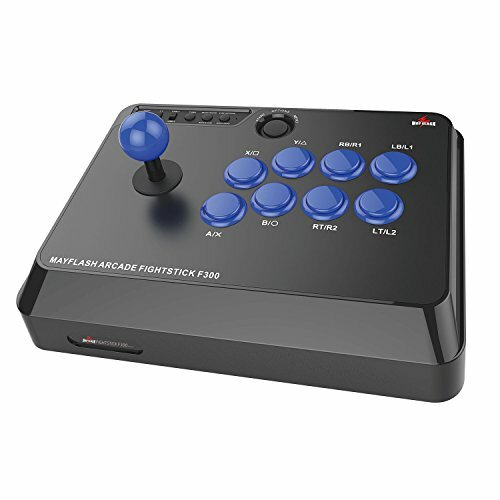 -Compatible with Sanwa Denshi buttons and joystick that is perfect for customization to make it your very own. (Sanwa Denshi buttons and joystick are not included in the packaging and you need to buy them separately). -A SONY PS4 Controller is required when using on a PS4 Game Console, and a Microsoft XBOX 360 or XBOX ONE Controller is required when using on a XBOX 360 or XBOX ONE Game Console. -The lever and buttons are designed and placed on same layout as the arcade style. -The Fighting Stick has considerable heft and rubber feet, both of which work to hold the controller firmly in place on hard, flat surfaces. -Compatible with Windows XP/Vista/Windows 7/ Windows 8/Windows 10 . If you have any questions about this product by May Flash, contact us by completing and submitting the form below. If you are looking for a specif part number, please include it with your message.